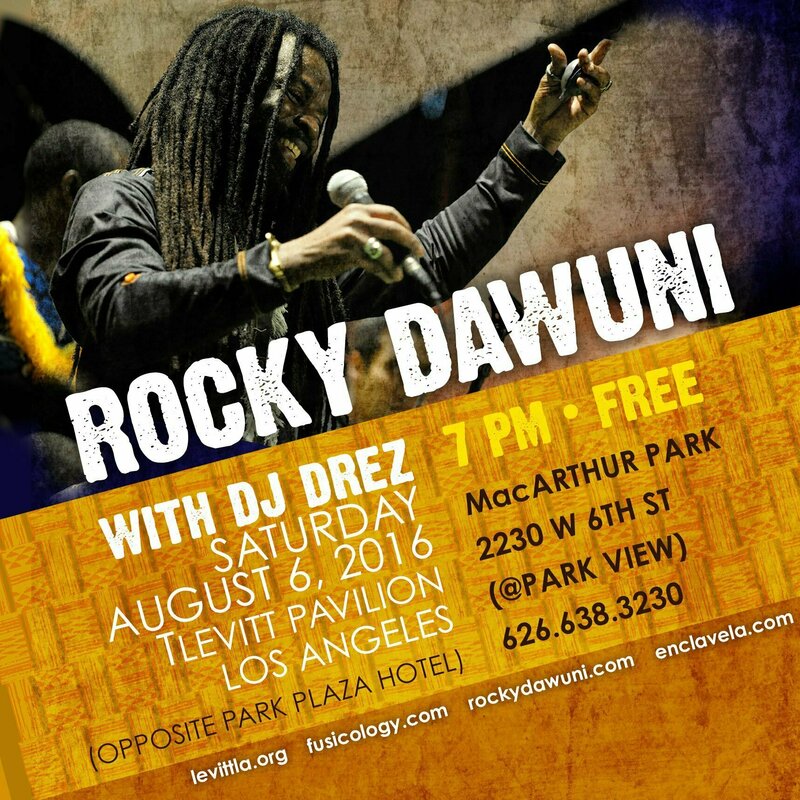 GRAMMY nominated Afro Roots star, Rocky Dawuni, returns from his highly successful summer tour of Europe and India to bring his fiery sound once again to light up the City of Angels, on Saturday August 6th at the Levitt Pavilion Los Angeles in MacArthur Park. The “Branches of the Same Tree Tour” thrilled huge audiences across Spain, Belgium, Germany, Latvia, Czech Republic as well as a performance at the legendary Bangalore Place in India with GRAMMY winning musician / composer Ricky Kej and very special guests. Rocky Dawuni and his all star band will be joined by famed DJ Drez who has performed with Rocky off and on for many years and now is one of the top DJs in the wellness and yoga communities. DJ Drez bio: Peacefully determined. Lover. Sound Ambassador. Hip hopper. Mind astronaut. Grateful. Beat maker. Student always. Sometimes teacher. Disciplined. Turntablist. From LA, Earth. Haiku D’Etat. Abstract Tribe Unique. Dreaming In Sanskrit. World Traveler. Dancer. Passionate. Compassionate. Yogi. Vishnu. Rasta. Friend. Father. Husband. Wildly calm. Love, respect and get off on what I do. Please JOIN US for this amazing night of live music, turntablism and dancing under the stars in Los Angeles at the beautiful Levitt Pavilion Los Angeles with friends and family! Levitt Pavilion for the Performing Arts Los Angeles at MacArthur Park (LevittLA) is a 501(c)(3) non-profit organization founded in 2007 to restore the historic band shell in MacArthur Park and present 50 summer concerts annually. Admission is always FREE, making live music and the arts accessible to all. The concerts feature a diverse lineup of artists from acclaimed, emerging talent to seasoned, award-winning performers. Programming is designed to appeal to all tastes, bringing people from all walks of life together to share an evening of great music. As music fills the park, so do families, friends, and Angelinos from all over the city creating community through music. Since 2007, over 250,000 people have gathered in MacArthur Park to picnic on the grassy lawn and enjoy music under the stars. Each year, LevittLA relies on generous support from the community, private foundations, government programs and corporate sponsors to produce its culturally diverse Summer Concert Season. We welcome your new or continuing support! Contributions of any amount underscore the power of the performing arts to build community, reclaim out city’s green spaces, and foster dreams. Together, we are connecting Angelinos and inspiring generations to come, as music plays in MacArthur Park. Donations are fully tax-deductible.